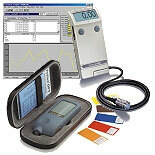 At PCE Instruments you will find thickness meters for determining the thickness of paint and surface coatings. The principles behind measuring paint and coating thickness in these thickness meters is the magnetic induction or the interference to current. 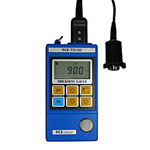 These thickness meters can be used for all types of metal surfaces (steel, iron, non-ferrous metals). For these reasons, the thickness meters can be used wherever there is a galvanizing process. These devices are particularly practical for quality control in anodizing, galvanizing and zinc coating. They are also perfect f or measuring body paint thickness on cars. You can also find different types of thickness meters for measuring wall thickness and determine the hardness of walls, metals, plastics and glass. Also, special manual devices can be found, with a test sensor that can operate up to a temperature of 300°C. These devices are suited for measuring wall thickness and determining the durability of walls with vapours as well as pressure conduction. So that the sound waves are transmitted correctly, and to gua rantee a high level of accuracy, a small amount of coupling gel should be used when placing the sensor head on the surface being measured then the sound velocity can be adjusted and the device will accurately show the thickness of the surface. Thickness meters for metal, plastic, paper, wood and precious stones, are also available from the online shop. You can find both digital and analogue models available covering a measurement range of 1.2 to 225mm of material thickness. Some models allow for user selectable sound velocity between 1000 and 9999m/s for a more diverse range of different materials. Each device comes with an internal memory for 10 readings. Results can be obtained quickly on the job thanks to the easy of use of the thickness meters. They are a great help to personnel working in technical service or repair. One special application for thickness meters is in the appraisal of precious stones, jewels, and other objects of value, by measuring the hardness of the material. The technical specifications for our thickness meters can be found at the links listed below. If you have any questions in regards to thickness meters, call us on: UK customers +44(0) 23 809 870 30 / US customers (561) 320-9162. Our technicians will be happy to assist you about these devices or any other measuring instrument we have available. non-ferrous metals. In this process eddy-currents will be induced in the measurement object. This is possible due to the coil that produces a changing magnetic field. The determination of coating thickness will be carried out by the measurement of eddy currents that is retroacting to the coil. The magnet inductive method is used to measure non-conductive coatings like varnish and colour on ferrous metals. In this process, a magnetic field will be produced via a magnetic coil. Through approach on a magnetic ground the magnetic field will be changed. The variation in the magnetic field depends on the distance from the ground to the measuring sensor. Due to this it depends on the coating thickness. During an ultrasonic test with thickness meters, the surface will be shoot with ultrasonic waves. These will be reflected by the coating, partly. Most of the waves will enter the varnish coating until they get to the next surface (material surface). At this point, ultrasonic waves will be reflected again. Through measurement of the reflected waves, the coating thickness can be determined. If you wish to view or print a selection of thickness meters from our catalogue, click the PDF symbol.